Are you still working on burning off the fat with traditional training and long steady state bout of cardio? I hope not! 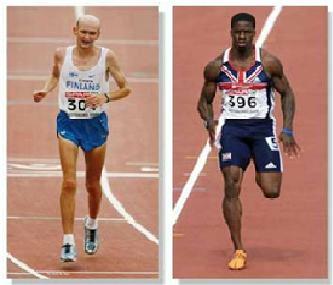 Contrast the physique of a long distance runner and a sprinter. The former is usually skinny fat meaning he/she doesn’t have much muscle and even though they are not overweight they have a pretty high percentage of body fat considering their weight. The sprinter on the other hand has a good amount of muscle and is much, much leaner. Let’s look at the training difference between the two. Even though we are not taking genetics into account as well as some other factors, research as well as real world application shows that even though the long distance runners do much, much more cardio (most if not all of it steady state), they still carry a higher body fat percentage and less muscle than sprinters and other high intensity athletes. Just to throw a study at you that proves where I’m going with this. In 2001 East Tenessee State University looked at two groups of obese women. One group performed steady state aerobic work 3 times a week for 8 weeks while the other group performed high intensity interval training for the same amount of days and weeks. Both groups exercised each session until they reached 30o calories burned. The end result? Only the high intensity interval group improved body composition! Not only that, they revealed no increases in resting metabolic rate for the aerobic group while there were increases in the metabolic rates of the interval group for over 24 hours. The groups exercised the same amount as far as caloric output, yet the interval group lost fat and raised post exercise metabolic rates while the steady state group saw no improvements. So what are some examples of cardio strength training? - Timed Sets or Density Training: there are many ways to do density training but I like to pick an exercise from each movement pattern and take a certain amount of time in which you will work through the circuits non stop (for instance 20 minutes). Here is a list of the exercises we used with a personal training client at Renton Hocevar Performance gym. - Timed Intervals: these could be split up to almost any work/rest ratio. 30/30, 40/20, 20/10, etc. and they can also go on for a predetermined amount of time (5, 10, 20 minutes or more….and everything in between). The possibilities are endless as are the exercises you can plug in! This is one of the tools we use at the www.RentonResultsBootcamp.com. - Outdoor Training: you can take your training outdoors with any tools that you want but there is no easier way than doing sprint training as well as bodyweight circuits outside as you do not need anything but your body. Sprints are highly metabolic and are incredible for fat burning. I’m also a huge fan of strongman training so we like to put some strongman exercises into interval form. These exercises will be individualized for the level of trainee that is performing them. If you would like to find out your training success blueprint then schedule a free consult/assessment at Hocevar Performance. There are many other ways to do cardio strength training but I hope this post gave you an idea of some of the possibilities. You can use cardio strength training on the days you are not doing your regular strength training program or at the end of your regular strength training session. For a complete fat loss program that has been proven time and again (training and nutrition! ), check out Warp Speed Fat Loss.